At least one weekend a year, bats–particularly the vampiric kind–command more attention than birds, at least from most people. Nature lovers, on the other hand, find time for wildlife watching every weekend. Just be sure to choose a Halloween costume that doesn’t obscure your vision too much! I saw lots of different kinds of woodpeckers this weekend, but that big, honking Pileated always wins out over the others for Best Bird honors. Corey had high hopes for finding something rare along the coast of Queens this weekend but was disappointed by a rather pedestrian outing on Saturday. He and his friend Seth did find one good bird at Jacob Riis Park, a continuing Cattle Egret, which is common across large chunks of the world but was only Corey’s sixth sighting in New York State, with the fifth having been the same individual bird during the week last week. 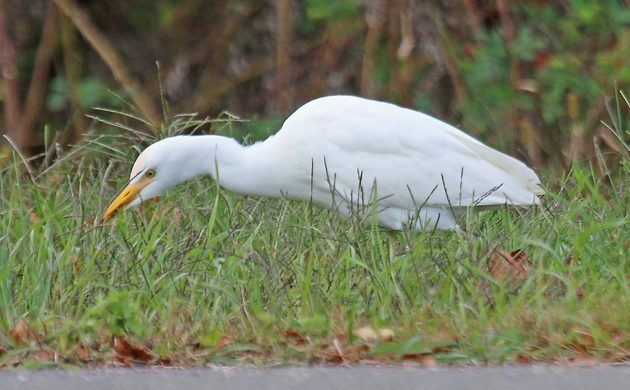 Though Floridians might laugh, the Cattle Egret is Corey’s Best Bird of the Weekend. How about you? What was your best bird of the weekend? Tell us in the comments section about the rarest, loveliest, or most fascinating bird you observed. If you’ve blogged about your weekend experience, you should include a link in your comment. Happy Halloween! I was in Spain and got to see several unusual birds, including this weekend a couple of stunning Eurasian Kestrels!